Video: President Obama addressed the nation Tuesday regarding the government shutdown, telling Congress to take a vote on a continuing resolution to end the government shutdown. President Obama delivered a statement and took questions from reporters on the partial government shutdown and the looming fight over raising the federal debt ceiling on Oct. 8 at the White House. PRESIDENT OBAMA: Good afternoon, everybody. I am eager to take your questions, so I’ll try to be brief at the top.This morning I had a chance to speak with Speaker Boehner. And I told him what I’ve been saying publicly, that I am happy to talk with him and other Republicans about anything — not just issues I think are important but also issues that they think are important. But I also told him that having such a conversation, talks, negotiations shouldn’t require hanging the threats of a government shutdown or economic chaos over the heads of the American people. Think about it this way, the American people do not get to demand a ransom for doing their jobs. You don’t get a chance to call your bank and say I’m not going to pay my mortgage this month unless you throw in a new car and an Xbox. If you’re in negotiations around buying somebody’s house, you don’t get to say, well, let’s talk about the price I’m going to pay, and if you don’t give the price then I’m going to burn down your house. That’s not how negotiations work. That’s not how it happens in business. That’s not how it happens in private life. In the same way, members of Congress, and the House Republicans in particular, don’t get to demand ransom in exchange for doing their jobs. 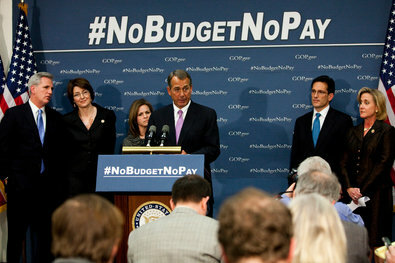 And two of their very basic jobs are passing a budget and making sure that America’s paying its bills. They don’t also get to say, you know, unless you give me what the voters rejected in the last election, I’m going to cause a recession. That’s not how it works. No American president would deal with a foreign leader like this. Most of you would not deal with either co- workers or business associates in this fashion. And we shouldn’t be dealing this way here in Washington. And you know, I’ve heard Republicans suggest that, well, no, this is reasonable, that this is entirely appropriate. But as I’ve said before, imagine if a Democratic Congress threatened to crash the global economy unless a Republican president agreed to gun background checks or immigration reform. I think it’s fair to say that Republicans would not think that was appropriate. So let’s lift these threats from our families and our businesses, and let’s get down to work. It’s not like this is a new position that I’m taking here. I had Speaker Boehner and the other leaders in just last week. Either my chief of staff or I have had serious conversations on the budget with Republicans more than 20 times since March. So we’ve been talking all kinds of business. What we haven’t been able to get are serious positions from the Republicans that would allow us to actually resolve some core differences. And they have decided to run out the clock until there’s a government shutdown or the possibility of default, thinking that it would give them more leverage. That’s not my characterization. They’ve said it themselves. That was their strategy from the start. And that is not how our government is supposed to run.